There’s two of me and Lili. and my head shaved Easter clean. Mama’s blurry foot lifted up in the air. When I look at the picture I can hear it. Lonnie’s parents died when he was seven, and now he and his sister live in different foster homes. He gets to see his sister, though, and his foster mom turns out to be a really nice lady, even if he was afraid of her at first. Still, he longs for his life back before the fire that killed his mom and dad. However, he’s learning a new way to cope. Now Lonnie is eleven, and he’s learning about poetry in school. His teacher says it helps people sort out their feelings. He writes so many poems, the good kind of poems-those natural, thoughtful poems that feel like breathing-that it fills up a book. Lonnie’s story. You’ll love it even if you don’t love poetry, I promise. Teachers will love the book’s natural fit for teaching forms of the poem: students will be introduced to the sonnet, haiku, and free verse as Lonnie learns them. Students will love the book because it is a concise 100 pages, and of verse, at that: it’s an easy triumph for young readers who are exhausted by marathon reads. I love it because the poems are just right: accessible, full of concentrated emotion, and well-written. I also love it because of Lonnie’s capacity for rejoicing in a world that hurt him badly. If you’ve got a bit of time, I invite you to see what the world of an eleven-year-old poet in foster care looks like. Woodson, Jacqueline. Locomotion. New York: Speak, 2003. 100 pp. Ages 11-14. If you liked this book, you’re in luck! There’s another, called Peace, Locomotion, and it looks great. Actually, here is Jacqueline Woodson’s whole long list of books, just in case you’d like to see what other things she’s been up to. If you are really into the poetry novels, try Make Lemonade. I just reviewed the second one in the trilogy! 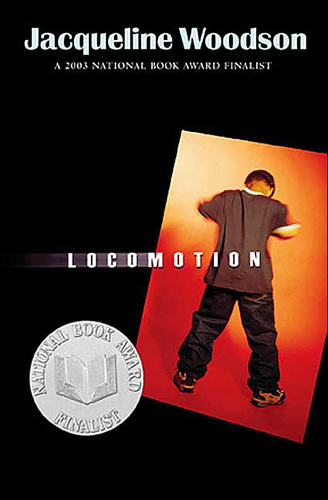 Posted on February 27, 2013 by ShannaPosted in Ages 11-14, Coretta Scott King Honor, National Book Award Finalist, Realistic Fiction, Series, Verse NovelTagged foster care, foster children, free verse, New York, poetry.